Patty's Utopia: Why You Must Visit the "Visions & Environments" Latino Art Exhibit. Why You Must Visit the "Visions & Environments" Latino Art Exhibit. We are so lucky to live in a city where art, in all its forms, is highly appreciated. And it makes me incredible happy to see that more, and more Latino artists, are given the opportunity to showcase their art to the general public. 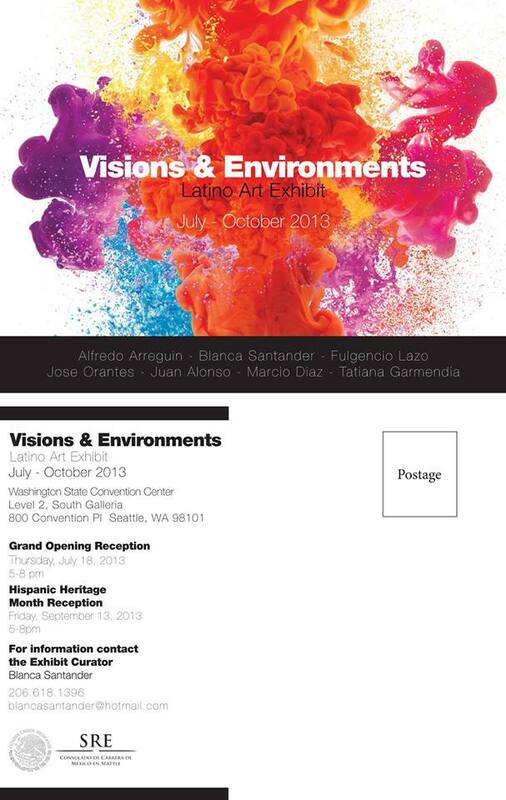 This time, I'd like to tell you about the "Visions & Environments" art exhibit that will be running from July through October 2013, at the Washington State Convention Center. I was tempted to take more pictures of the paintings, and photographs that are hanging on the walls of the Convention Center, but I thought it would be best if you go in person to admire these pieces of art. So, there you have it. The reasons you must visit this exhibit: you will not only see some beautiful art, you will also be supporting more Latino artists, and you will do it for FREE! Believe me, you will not regret it. Thanks so much my dear for your support to the arts! I'm speechless with this beautiful surprise. It's my pleasure, and the least that I can do! Al contrario, gracias a ustedes por compartir su valioso trabajo. I was also at the exhibit. I find all the work Impressive and beautiful with the exposure of color. Me gustan mucho! All the artists are fantastic! Thank you for sharing your thoughts. Cuatro Amigas. Our Stories. Our Project. Something Different To Do in Seattle Tonight!